Jon Stewart, yes, the one from Comedy Central’s The Daily Show had Erik Prince as a guest. Mr. Prince was promoting his new book, Civilian Warriors. I was a bit surprised. 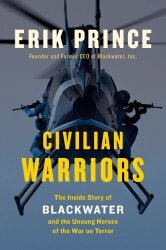 Stewart is known to come from the liberal end of the spectrum, he simply interviewed Erik Prince about his book and some details of his career as the founder, CEO, President of the controversial organization known as Blackwater. I thought he’d be more probing and cynical of Mr. Prince due to the stories conveyed in the media about his past organization, but he wasn’t. Mr. Prince presented him well, no question leading to him being a successful business person, but you could tell that he felt slighted in his dealings with the US government and that he truly believed what he was doing was noble and that there was another side of the story that the media refused to convey to the public. In the beginning of the book Mr. Prince talks about his father and how grew his business into a flourishing one. Erik learned some life lessons from his father, and while the younger Prince seemed to come from a family of privilege, it didn’t seem to be a factor in Prince’s life. If I recall correctly, he even tried to separate himself from his family’s social standing as to not take advantage of it. However, Prince does use some of his family’s money to start Blackwater.